The HHM29 series has been discontinued. Please see the HHM9007R as possible alternatives or contact our Engineering department. The HHM29 is a low cost digital multimeter/thermometer. 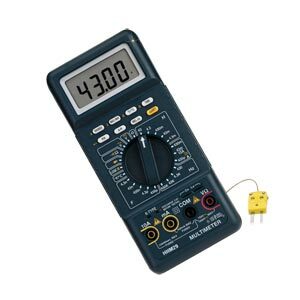 This multimeter measures and displays voltage, current, resistance, inductance, capacitance and frequency, and has a type K thermocouple input for temperature measurement. Special features include min, max and average reading, manual/auto range and a built-in timer. 참고: Each unit comes complete with type K beaded wire thermocouple, 9 V and 2 AA batteries, test leads and operator’s manual.